Farm, Educational -- Fernbrook Farms Education Center - Are We There Yet? Located on a 230 acre working farm, Fernbrook Farms Environmental Education Center is one component of a complex which also includes the Fernbrook Nursery (tree nursery), the Inn at Fernbrook (B&B), and Fernbrook Farm CSA, a Community Supported Agriculture farm where local citizens can purchase a share on an annual basis and enjoy some of the organic vegetebles in exchange, as well as participate in the farming itself if they choose. The Education Center is a nonprofit organization formed to educate children and adults about agriculture, food and the environment. 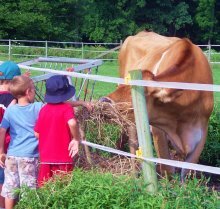 Through a variety of hands-on programs, ranging from Birthday Party Programs to Homeschool Classes, to Family Programs, School Field Trips, and even Summer Day Camp, students learn about ecology, our food sources, and the importance of good nutrition -- all in a healthy outdoor, fun environment. The following examples are offered to give an idea of some of the types of programs available. For current, complete information, visit the official website, linked above. Working With The Land: includes investigations of soil & worms, farm animals, a visit to our vegetable farm, and a tractor-pulled wagon ride around the farm. Forest Ecology: includes investigations about trees, decomposers, animal populations, and forest wildlife. Seasonal maple sugaring investigation available. Watersheds and Wetlands: includes investigations of pond life, creek life, a watershed hike, and wetlands soil. Groups of 10 - 15 at a time rotate through four "Investigation Stations" for about 30 minutes of hands-on, fun learning on the chosen program, led by a Fernbrook Educator. Other Field Trip programs are available. See the Center's official website, linked above. All programs align with the New Jersey Core Currriculum Content and Next Generation Science Standards. Programs can be adapted for just about any grade level, as well as for other organized groups, such as Scouts. Outreach Programs are available for individual classrooms or assemblies of up to 200 students. Visit the Center's website or call for the details. Homeschoolers of children age 6 to 14 can take advantage of a wide range of 8-week programs (one 2-hour day per week) to give their students a good grounding in ecology through hands-on programs at the Center. A calendar of seasonal events and programs for Families offers many fun, educational activities. See the official website. Hours: Programs are by appointment only. Groups: A fee is charged for group programs. Please call for details. Group Reservations: Advance scheduling required and is offered on a first-come, first-served basis. Lunch: Picnic areas available for groups. Handicapped Access: Call to discuss your needs. Directions: Obtain specific directions when booking a program.